After Saturday's deadly demonstration by KKK and neo-Nazi groups in Charlottesville, Virginia, a North Carolina woman decided she could no longer stay quiet about a man flying a Nazi flag in her town. 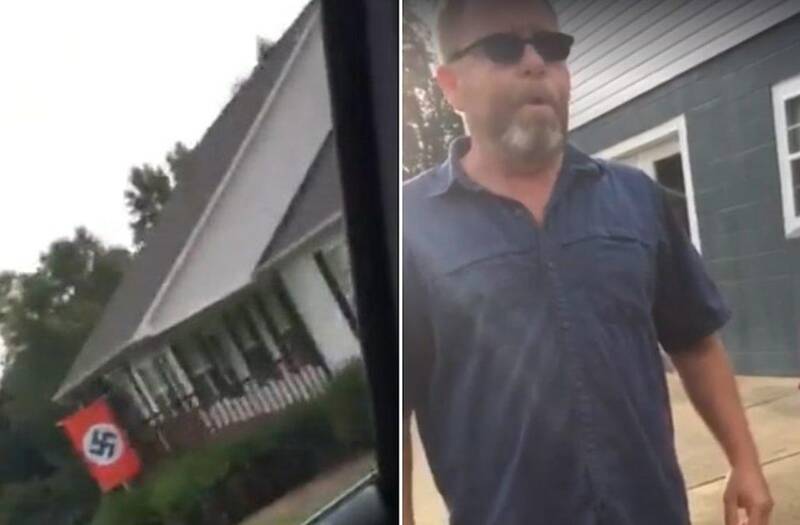 Page Braswell, 44, told the Charlotte Observer that she didn't know her neighbor, who identified himself as Joe Love, before approaching him in his driveway on Sunday. "Hey! What's up with the Nazi flag?" Braswell can be seen asking Love in a video that has been stirring strong reaction online. Love lashed back against Braswell, asking, "What's it to you? Do you make the payments on this f***ing house?" He then proceeded to launch an expletive-laden tirade at Braswell, before asking her again, "What's it to you?" "Because this is America, not Nazi Germany," she replied while recording the exchange. The confrontation lasted for roughly two minutes and ended with Braswell safely driving away from the man's residence. Since posting the video to Facebook, Braswell's exchange with Love has garnered more than 450,000 views. "We need to ALL stand against Nazis," Braswell captioned the video. "Share far and wide; let's run this Nazi out of town. For real." He said he just put up the flag after several of his other flags had been stolen.